the flaps and improve packing/unpacking operational efficiency through unimpeded operator access to box content. Because all boxes remain as single, intact containers when the clips are employed, cost-saving reuse is possible, as is more efficient recycling and disposal. For added security and to bolster strength for stacking boxes, clips can be positioned at each of the four corners, helping to better distribute loads and prevent box sides from sagging. 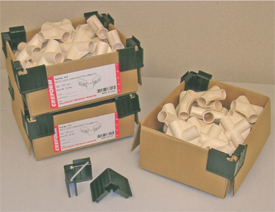 Clip configuration also allows for the use of plastic cable ties that, when installed diagonally across each clip, reinforce and brace the corners for heavy box-stacking applications. how much are your carton clips and how do you order them?